Secunia Security Advisory - Debian has issued an update for libxfont. This fixes a vulnerability, which can be exploited by malicious, local users to gain escalated privileges. Secunia Security Advisory - Slackware has issued an update for bind. This fixes two vulnerabilities, which can be exploited by malicious people to cause a DoS (Denial of Service). Secunia Security Advisory - muuratsalo has discovered two vulnerabilities in awiki, which can be exploited by malicious people to disclose sensitive information. Secunia Security Advisory - A weakness has been reported in Xen, which can be exploited by malicious, local users in a guest virtual machine to cause a DoS (Denial of Service). Secunia Security Advisory - A vulnerability has been reported in Novell eDirectory, which can be exploited by malicious people to bypass certain security restrictions. Secunia Security Advisory - Debian has issued an update for freetype. This fixes a vulnerability, which can be exploited by malicious people to compromise a user's system. Secunia Security Advisory - A vulnerability has been reported in Apache Tomcat, which can be exploited by malicious users to disclose sensitive information or manipulate certain data. Secunia Security Advisory - Penguin has reported a vulnerability in the Shop module for Contrexx CMS, which can be exploited by malicious people to conduct SQL injection attacks. Secunia Security Advisory - A security issue has been reported in Dropbox for Android, which can be exploited by malicious people to bypass certain security restrictions. Secunia Security Advisory - A weakness has been reported in Apache Tomcat, which can be exploited by malicious, local users to disclose sensitive information. Secunia Security Advisory - A vulnerability has been reported in Gimp, which can be exploited by malicious people to potentially compromise a user's system. Secunia Security Advisory - A security issue has been reported in ax25-tools, which can be exploited by malicious users to perform certain actions with escalated privileges. Secunia Security Advisory - Some vulnerabilities have been reported in various Symantec products, which can be exploited by malicious people to compromise a vulnerable system. Secunia Security Advisory - A vulnerability has been reported in the RAXO All-mode PRO module for Joomla!, which can be exploited by malicious people to compromise a vulnerable system. Secunia Security Advisory - A vulnerability has been reported in MPlayer, which can be exploited by malicious people to compromise a user's system. Fofou Forums suffers from a cross site scripting vulnerability. A Privilege escalation vulnerability was discovered in Asterisk Manager User Shell. A Denial of Service vulnerability was identified on systems that have the Asterisk Manager Interface, Skinny, SIP over TCP, or the built in HTTP server enabled. A use-after-free vulnerability was discovered in Microsoft Corp.'s Internet Explorer. A memory corruption vulnerability was discovered in Microsoft Excel. SAY Communication suffers from a remote SQL injection vulnerability. is there a script to auto append a text file with #'s to its designated @cell.phone.provider.net ?? VedCor suffers from a remote SQL injection vulnerability. I have installed BT5 on my Samsung Infuse, based on instructions from http://blog.l-lacker.com/security-ba...alaxy-s-phone/. However, after I log into bt, and startvnc, the vnc viewer shows an error "There is a problem with the configuration server. (/usr/lib/libgconf2-4/gconf-sanity-check-2 exited with status 256)". I have tried using all sorts of geometry (including 800x480) for the startvnc script. I have set all privileges for a whole bunch of files, based on other people's posts for other devices. Nothing has worked. Please let me know if anybody has tried this on an Infuse and/or has any suggestions. Thank you very much. DoodleIT suffers from a remote SQL injection vulnerability. Online Business Source CMS suffers from a remote SQL injection vulnerability. OATH Toolkit attempts to collect several tools that are useful when deploying technologies related to OATH, such as HOTP one-time passwords. It is a fork of the earlier HOTP Toolkit. TCP/IP connections on port 7175? [-] Error while running command db_connect: Failed to connect to the database: FATAL: Ident authentication failed for user "postgres"
CdeVision suffers from a remote SQL injection vulnerability. Kolay PageRank Sorgulama suffers from a cross site scripting vulnerability. OpenSSL-based signcode utility is used for Authenticode signing of EXE/CAB files. It also supports timestamping. Awiki version 20100125 suffers from a local file inclusion vulnerability. PHP-Nuke article.php remote SQL injection exploit. I'm playing around with the Back Track 5 distro - and I went to install it on my test pc. I already have a copy of ubuntu running on this machine, and I followed all the instructions on screen for running a dual boot machine with ubuntu and back track sharing my 500gb drive. The partitioning said it was going to split the drive in half which was fine with me. When it said it was finished, I rebooted, and after post it never makes it to the grub screen for selecting what os to load, it just reboots. Over and over n over. . . . hrm . .. .
Well I'm not too worried about it because it's just a play machine. But I'm learning linux and I'm not really sure where to look at this point. I know I can still boot on the back track CD - but I'm not exactly sure what too look for after that. I can access the drive from the boot cd, so I was thinking I needed to find the grub and see what happened with that. So i was playing with my 'Sources.list' And then changed repositories by mistake. It is now updating etc. From ubuntu security sites. Would anyone be able to tell me what the default values for sources.list are or if there is a way to restore the original source.list file. I want to connect via bluetooth to my handy. Simple HTTPd version 1.42 denial of service exploit. Allomani Songs and Clips version 2.x remote blind SQL injection exploit. Backend suffers from a remote SQL injection vulnerability. Sorry for my bad English,i try to install gnome bt5 32bit , I have a problem with the install ubiquity on step 3. The installer gets stuck in step 3 and does not go to next step! Does anyone help me ? 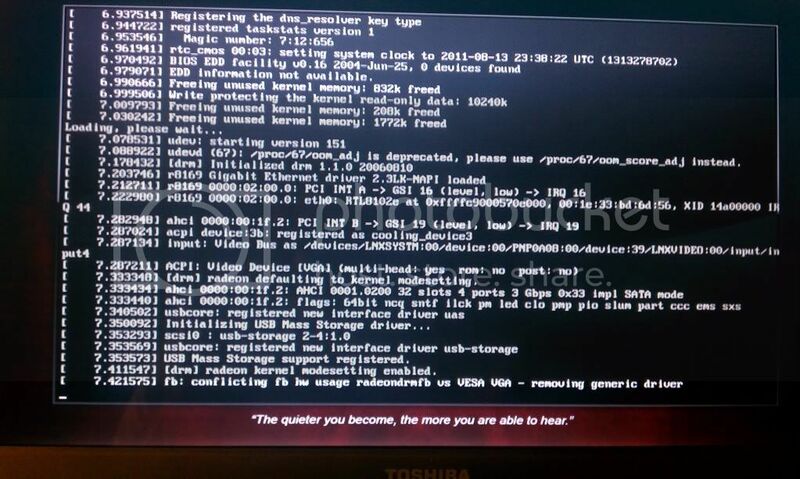 Can't Boot Backtrack 5 from USB. I've tried using Backtrack 5 KDE 32 bit, and gnome as well, but it gets stuck at the same spot. I can't type or do anything when it gets there, its just frozen, so I just restart my computer. I have a Toshiba Satellite A305-S6916 running Windows 7 64 bit. Does anyone know how to fix this? Is it maybe cause the usb is to small? I appreciate any further assistance.